Vacation rental house. Sleeps 11, 4 bedrooms, 2 bathrooms. Cats, Dogs allowed. Check in was easy-peezy, even after hours. There is standing water all around the house, so you have to squash thru mud to get to the beach, and go down to the beach using the next door neighbor's path, but that's okay. The problems with the house: there is noplace for your clothes; no dressers, no drawers, noplace to put your suitcase so you live out of the case on the floor. The beds are VERY comfortable. The water is terrible so the toilets look nasty but I think they're actually clean; they just look bad. NO soap-- no laundry detergent, no dishwasher detergent, no bath soap. nada. the air conditioner was awesome, though, and ceiling fans are great, in every room. WE had a good time, and for the money -- not a bad experience. Very nice! Enjoyed every day! Great place rented. We will definitely be back!! Beach Barn was clean, conveniently located, and right on the beach!! Me and four of my friends have been wanting a girls beach trip for several years. It exceeded our expectations. The house was just fine (not fancy but comfortable) and location is spectacular. Bluewater rentals made it quick and easy and the young lady in the office was very sweet. Surfside is a great beach. We will be back! Enjoyed Surfside Beach. Rental was adequate but in need of a few repairs. Pic nic table needs to be removed, very wobbly and unsafe. Sliding glass door was off track and difficult to open. But property is beach front with amazing views. The house was clean and any questions we had were attended to promptly. We had a great time. The location was great with an easy access and view of the beach. This was our second trip back this year after renting it for a week this summer...unfortunately the weather was not as cooperative but Hey... the Beach is the Beach! 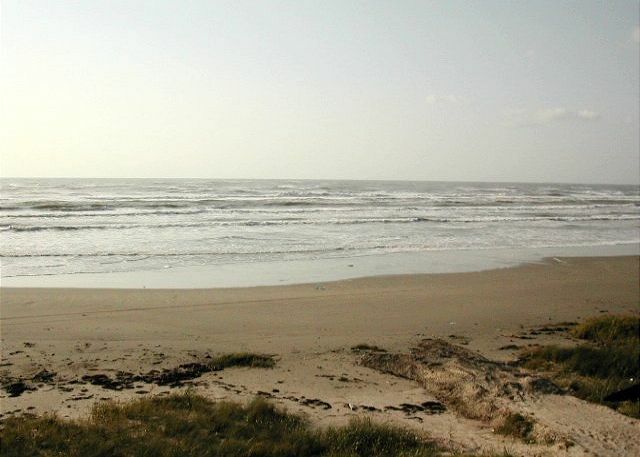 My first experience with Brannan was 39 years ago as a High School Senior in Houston when we rented a house for a week after graduation... Surfside had always been our beach of choice. Fast forward and now living in Michigan.. I started researching houses online last year in the bitter winter. Experience now tells me that I nailed it with the Beach Barn. Location is everything.. and beachfront in Swan Lake is where to be. The layout is cozy.. with a Master downstairs and really a 2nd Master upstairs along with 2 additional bedrooms. We were 4 adults, 2 kids, and a Border collie and everyone had their space... Outside, right down the front stairs across the grass, thru the cutout and you're on the sand.. and not much traffic being so close to the county/city line. As I write this I'm already planning a 10 day visit next summer. I wish I owned this house. That being said..the only thing I would point out is that the deck is really showing signs of weathering..could use some attention as well as the picnic table needs replacing. Can't wait for summer again!!! The Beach Barn was clean when we got there. We had a great time and all pitched in to clean it per instructions on the sign out sheet. We had a great time. The place could have been a little cleaner but it was ok overall. This is my 7th rental in Surfside and will be back again. Wonderful week with awesome weather! Beach Barn exceeded my expectations. Very well stocked kitchen. Plan on returning in October! Good facilities had a great time the weather sucked but nice place to stay. First time at Surfside in over 10 years....we still love it. The weather was perfect, husband and son caught fish, neighbors were friendly. We built 11 sand animals that lasted all week. We will be back !!! Love everything, the location, cleanliness, the rental folks bend over backwards to make sure all is good! Couple of yrs back our cabin had to much rain water under it, so they put us in another until they could get situated.......all this makes for a great vacation!!! You walk out the door...there’s the Gulf of Mexico, God’s entertainment park! Water, sand and sun - what else do you need? And the Beach Barn itself is a wonderful place to relax when the temp gets a little too high or in the evening after a long day of water play. did not make any of the other eating establishments on this venture, however, I have a feeling they, too, are wonderful. Anyone reading this review......THUMBS UP!!! C’mon Down!!!! We enjoyed our stay and thought it was a good value for the experience. Not a Hilton, but not a motel 6 either. It had all the amenities needed for great week at the beach. Things that would have been nice would be an outdoor shower, looks like it had connection at the beach stairway, but no shower head. The upstairs bathroom light and fan on same switch and the fan makes a lot of noise for late night potty runs only to wake up everyone on the top floor, we resorted to using a flashlight. the pathway to the beach could have used some more grooming but was still very usable. TV was only local channels but I was able to link to my hotspot for netflix and amazon movies so the modern TV with WiFi was a life saver for late night movie choices tethered to my ATT hotspot. Beds are basic and sort of small, but after a long day on the beach, I still slept well, picky sleepers or tall people might have a challenge. AC worked well after replacing the batteries and cooled the place nicely. Bathrooms did not have any shelf space and bedrooms did not have closets. Two upstairs bedrooms did have a close rack, I would suggest adding racks to other bedrooms and/or folding suitcase stands like those in hotels. Shower heads could be better quality, but these were just small things and suggestions, as we had a great time at the Beach Barn. Grandparents and kids ages 11 & 7 had a great weekend even though it was a lil chilly. House is good for beach house. Can't remember if it explains clearly that beds are 1 king and 4 full size (not queen). OK for us. Kitchen had adequate equipment. Sofa has seen better days but you are at the beach. As a single father of 5 kids this was the perfect beach house and we will request it again in the future. great size, plenty of space and great beach right outside the door. Only suggestion bring drinking water the city water is horrible if it were my place i'd have a whole house water filter. The location of this house is great. It's right on the beach. We had some noisy neighbors, but that can't be helped. The common spaces are a bit small (kitchen, living room) but it doesn't really matter if you spend most of your time at the beach. Overall we enjoyed our stay at the Beach Barn. The Beach Barn is in a perfect location to be able to enjoy the beach. It has easy access to the water but also a beautiful double deck for those early mornings and late evenings. Our group had a wonderful time! we plan on doubling our stay! Thank you Bernadette for your hospitality and to Brennan Realty! We had a great time while staying in Surfside. Had some minor issues but it did not take away from a great time. Will be back again in the future. We had a wonderful Memorial Weekend 2011, stayed four nights (Mon-Fri) house has lots of beds with a great beachfront location and a nice deck. We had family over and had a blast. The only minor issues we had is the top deck patio door is broken and most of the remotes did not work or were missing batteries. We will probably try and book again next year. Thanks Brannan. Too bad Alex messed up the beach - we would have liked to have stayed the whole week. The Beach Barn was great. We had a fantastic trip. We were so pleased with everything and would come back tomorrow if we could. We had some family complain about the air conditioning, however, I think it was doing the best it could with 11 people coming in and out.